California residents have long been advocates of the eco-friendly movement, with many homes and businesses switching to solar power. 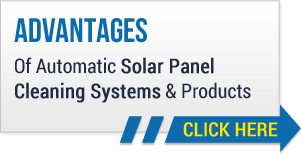 Automatic solar panel cleaning systems from Heliotex keep California solar panels clean, free of debris and working at optimum capacity whether they are installed in a commercial or residential setting. Our revolutionary solar panel cleaning systems take the danger and guesswork out of solar panel cleaning. Climbing up on rooftops to clean solar panels can be risky and lead to falls and damaged equipment. These problems were solved in 2008 when Heliotex introduced a revolutionary automatic solar panel cleaning system to California. Pollutants affect solar panels with varying degrees of severity, depending upon where your commercial solar panels are located in California. Dust, exhaust systems, wind, animal farms, jet aircraft exhaust, smokestacks, agricultural sprays and rain are contaminants that build up over time, resulting in reduced power output. Don’t allow soiling to reduce your return on investment. All commercial systems are custom designed for each specific site and conditions. Our systems remove the continual cleaning issue for the entire project lifetime. The first year return on investment alone for commercial systems can exceed 50 percent on some sites. This is accomplished by adding the 30 % tax credit (on new systems only), the first year of accelerated depreciation and the value of the additional electricity not lost to soiling. Heliotex commercial systems may also allow you the opportunity to reduce the amount of additional panels required to address soiling loss on your project. For more information about our automatic solar panel cleaning systems for commercial applications click here. For California homes and small businesses with a 150-panel or smaller solar system, a washing system is a smart investment. Our Heliotex system will allow you to avoid potential injury from falling, or damaging roofing or solar panels as well as the cost of expensive manual cleaning services. Dust and other pollutants are an issue that Californians deal with on a regular basis. Unless you plan to clean you panels manually once a week or so, then Heliotex Automatic Systems will keep the dust and debris from accumulating and reducing your electrical output between cleanings. Take full advantage of California’s sunshine with a solar panel cleaning system that lets your panels work their hardest! Learn more about our residential cleaning systems here.